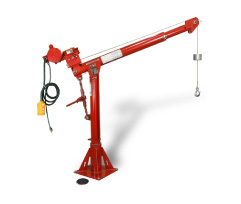 Portable Cranes - Thern Davit Cranes - Made in USA | Thern, Inc.
Thern has a wide variety of portable davit cranes that can move from one work area to another, making your work easier and more efficient. No matter what your lift and hoisting needs are, Thern has you covered with superior lifting equipment, from workstation cranes to davit hoists. 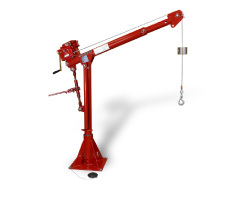 The Ensign 500 portable crane has an extra hook height for handling taller loads with minimal boom adjustment. This portable davit crane can be used with a hand or power winch operation and has a capacity of 500 lbs (226 kg). The Ensign 500 has a simple set up and is easy to use. This economical series is specially designed for clearance, lift height, and ergonomic operation. Thern’s First Mate series of davit cranes have a fixed boom length, making them affordable and lightweight with capacities up to 850 lbs (385 kg). The First Mate has an adjustable boom angle with three different positions for operation. The Ensign 1000 portable crane has a maximum hook height of 12 ft. (3048 mm) for handling taller loads or lifting over taller objects. This portable davit crane can be used with a hand or power winch operation and has a capacity of 1,200 lbs (544 kg). The Ensign 1000 has a simple set up and is easy to use. This economical series is specially designed for clearance, lift height, and ergonomic operation. The Commander series is Thern’s largest portable cranes that give you maximum flexibility with multiple boom lengths and angles to choose from. This portable davit crane can be used with a hand or power winch operation and has a capacity of 1,200 lbs (544 kg). 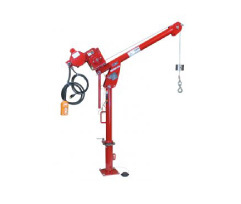 The Commander 1000 davit crane rotates 360 degrees on a pin and sleeve bearing in the base. A handle on the base of the crane makes rotation simple and easy. The adjustable boom telescopes to four different lengths and adjusts in height with a ratchet style screw-rack. The Commander 1000 breaks down for easy transport and storage. The Commander series is Thern’s largest portable cranes that give you maximum flexibility with multiple boom lengths and angles to choose from. 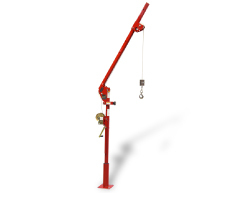 This portable davit crane can be used with a hand or power winch operation and has a capacity of 2,000 lbs (907 kg). 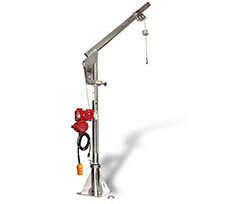 The Commander 2000 davit crane rotates 360 degrees on a pin and sleeve bearing in the base. A handle on the base of the crane makes rotation simple and easy. The adjustable boom telescopes to four different lengths and adjusts in height with a ratchet style screw-rack. The Commander 2000 breaks down for easy transport and storage.